The Roland GP607 Digital Grand Piano has a stunning finish and is packed with necessary features for the home environment. The mini grand piano size is large enough to attract attention, but remains small enough to comfortably fit inside the home environment. 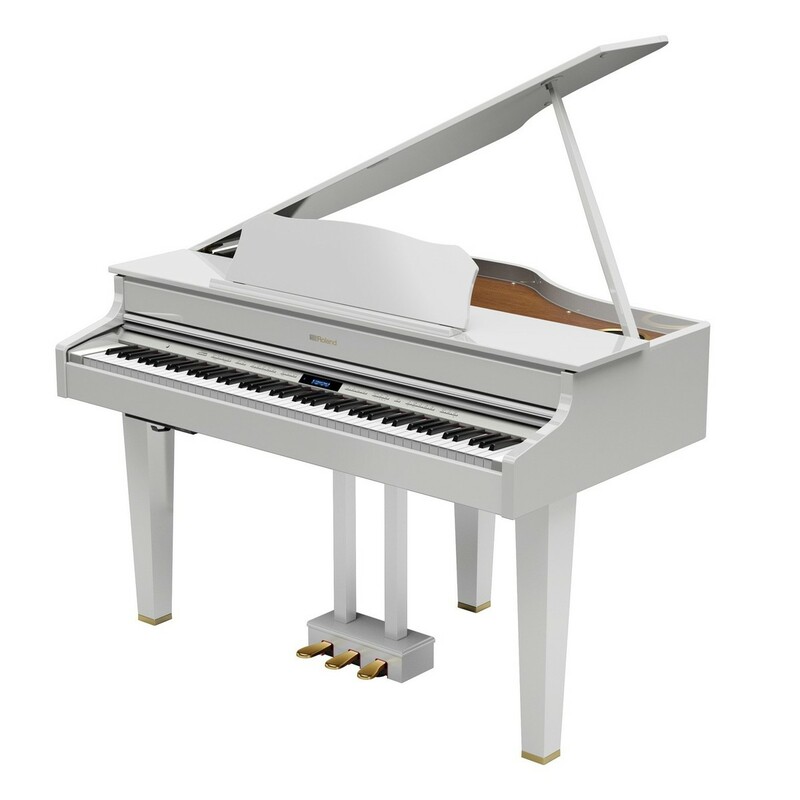 The SuperNATURAL piano modelling produces a rich, developed sound that is receptive to your unique playing style. The PHA-50 hammer action keyboard has a similar feel to a true acoustic piano. The Bluetooth connectivity enhances your experience with the GP607 by integrating it with a range of dedicated editing and playback apps. The polished white finish is a head turning look accompany to this versatile instrument. The GP series of pianos incorporate the Grand design for a stunning look. The mini grand piano design is ideal for home use due to its smaller, lighter size. 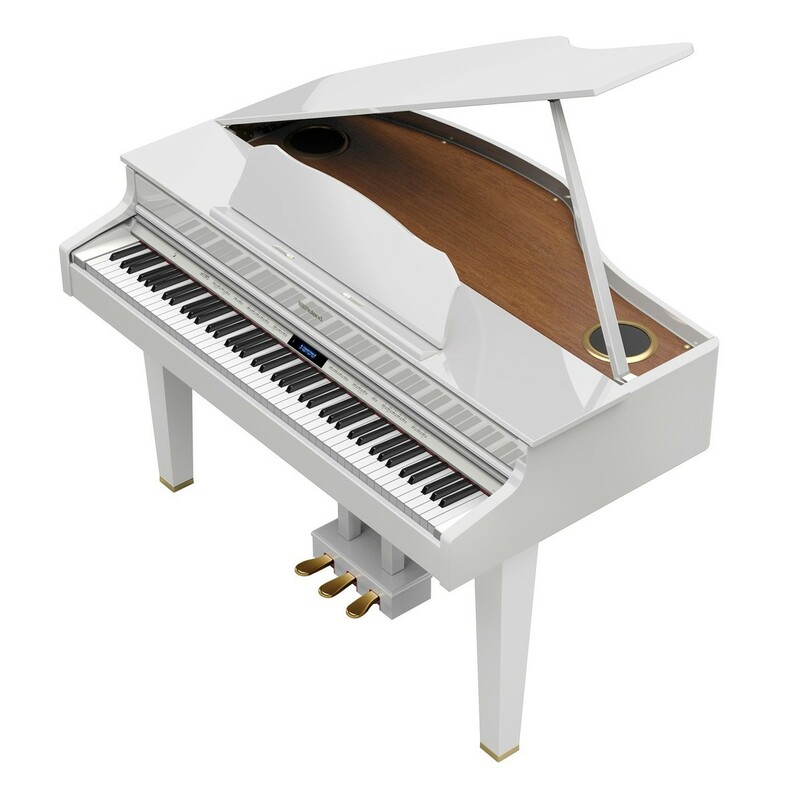 Despite being a digital piano, the opening and closing of the lid has an impact on the sound produced by the speakers for more accuracy to a real acoustic piano. The 4.1 multi-channel speaker system on the GP607 model has an immersive sound quality that is ideal projecting your notes. For musicians who want a piano to attract attention and have a stunning sound production, the GP series is an ideal choice. SuperNATURAL Piano technology powers the onboard grand piano sounds, delivering a world-class performance. The GP607 reacts seamlessly with your touch for a responsive and realistic performance. The intuitive Piano Designer feature makes it easy for you to personalise the GP607's tone and response to suit your taste. Parameters such as hammer noise, cabinet resonance and even single note character are all able to be edited for your specific requirements, giving each musician their own signature sound. Despite having the sound and feel of a traditional piano, the GP607 takes advantage of modern features to make it more accessible than ever. The integrated Bluetooth can be used to stream music from your phone or tablet, so you can play along to your favourite tracks. The USB memory slot can store your recorded performances directly as either a WAV or MP3 file. As well as this, your music production software can be connected via USB, making the GP607 a functional controller. Thanks to the Bluetooth/MIDI technology owners can use the Piano Partner 2 app. This free app follows the chords as you play and adds a full ensemble orchestra for a grand performance. This technology can also be utilised for sheet turning and the piaScore apps. A digital piano should be comfortable to play wherever you are. The GP607 features some of Roland’s flagship design and materials to achieve the most authentic feel. The PHA-50 progressive hammer action keyboard has a weighted feel with consistent response through the entire motion and release of each key. The wood and plastic hybrid construction has an identical response to an acoustic piano, whilst the coating ensures long lasting durability. The ebony/ivory feel keytops absorb subtle moisture from your fingers for a more organic feel over time. For the complete control of your sound, Roland has equipped the GP607 with a full three pedal system. 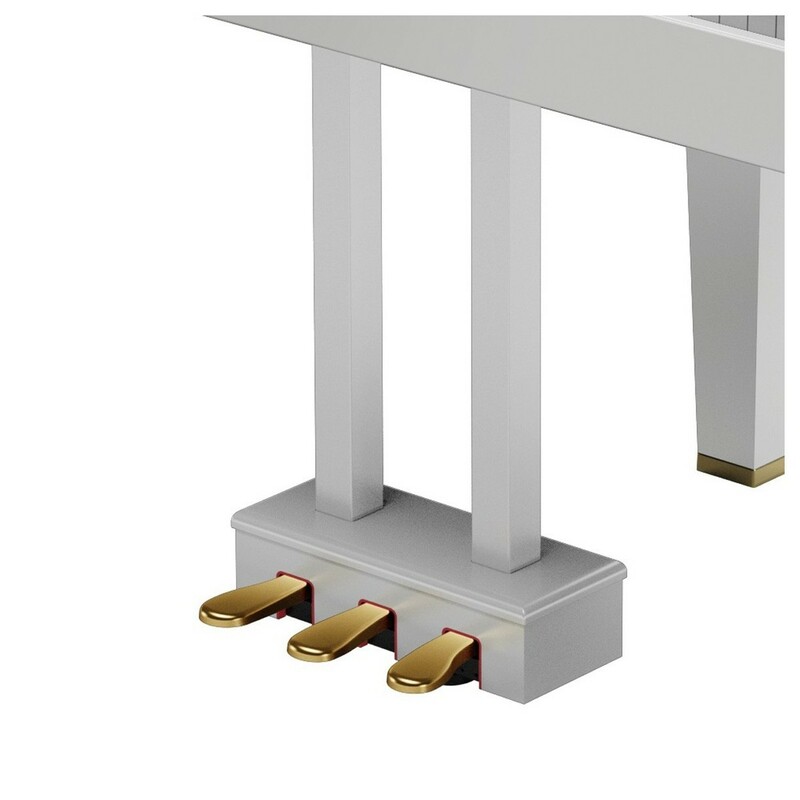 The damper and soft pedals are capable of continuous detection. The sostenuto and soft pedals are capable of assignable functions for a more personalised experience that takes advantage of the digital piano’s range of editable parameters. The pedals are housed in a smart unit that’s attached to your GP607. This provides both digital and acoustic piano musicians with an instantly recognisable feel and practical usage.